English Alternative Theatre was founded in November 1990 by Paul Stephen Lim, who teaches playwriting in the English Department at KU. To date, EAT has mounted over 50 full productions and 100 staged readings of plays. Of the playwrights who have been showcased thus far, over half have been KU students. "The Story of Izanagi and Izanami"
The plays by Boies, Price, Hilburn, Woods, Ferree, Newton, O'Brien, Fields, and Wirsig are now available either singly or in the Kennedy Center American College Theatre Festival "Best Student One Acts" series published by Dramatic Publishing. Paul Stephen Lim's play "Conpersonas" won the KCACTF National Student Playwriting Award in 1976, and the Kansas University production of the play was performed at the Kennedy Center in April of that year. For personal reasons, Lim resisted the advise of the William Morris Agency to move to New York. He chose to remain with his partner in Kansas, where he continued to write twelve more plays. Some of these have been produced throughout the years in Los Angeles and also Off Broadway in New York. Lim joined the creative writing staff of the English Department at Kansas University in 1989, and in the same year he founded English Alternative Theatre (EAT), a play-producing organization whose primary aim is to workshop and mount full productions of plays being written by his students. To date, EAT has sent plays by eighteen of his playwrights to various Region 5 festivals. Of these, five were invited to national festivals in Washington DC. And nine have now been published by Dramatic Publishing, Inc. 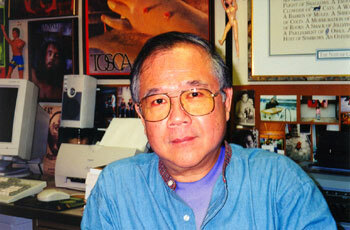 In 1996, Lim was awarded a Kennedy Center gold medallion for his work with student playwrights. Shortly after that, from Fall 1999 to Spring 2003, Lim served as National Playwriting Program chair for Region 5. His records show that he has gone "on the road" as KCACTF respondent/adjudicator for nearly a hundred productions of original student scripts. For Festival 36 of KCACTF 2003-2004, Lim served on the National Selection Team, seeing 75 productions in eight regions and traveling over 11,000 miles across the country. He finds it enormously satisfying to be able to do for young student playwrights today, what KCACTF did for him back in 1976. Lim's plays can be ordered in acting editions from: Samuel French, Inc., One Act Play Depot, or in its entirety as part of a package in the Asian American Drama Database from Alexander Street Press.